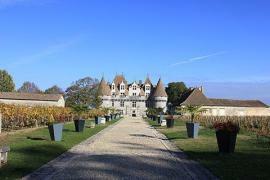 Issigeac is found to the south-east of Bergerac in the Perigord Pourpre region. Issigeac is a wonderful medieval village which is always particularly popular on Sunday mornings when it hosts one of the best markets in the area. The current town was largely built in the middle-ages, with buildings from the 13-16th century though its origins are much earlier. There are signs of pre-historic life, it was the site of a Gallo-Romain Villa and in the 10th century there was a monastery here linked to the abbey of Sarlat. Issigeac doesn't have a readily identifiable 'town centre' - rather it is a series of narrow winding streets lined with fascinating ancient buildings - some recently restored, others giving the impression that they are only standing due to the other houses hemmed in on both sides. This contributes significantly to the appeal of the village, in which it is easy to imagine yourself back in the 16th century. 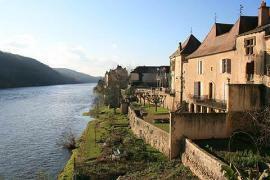 Issigeac really is a village not to be missed if you are in this part of the Dordogne. 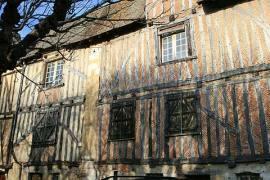 Many of the buildings are in whole or in part constructed in colombage, and several have interesting carved features. In particular keep your neck craned upwards to see the 'Maison des Têtes', on the corner of the Grand Rue, with some very ancient carved heads on its upper level. Sneak down the passageway below to see an internal courtyard falling to ruin at the moment but retaining its 'Romeo and Juliet' style balconies and medieval beauty. In the centre of Issigeac you can see the Palais des Eveques de Sarlat (Bishops palace) which was built in the 17th century. 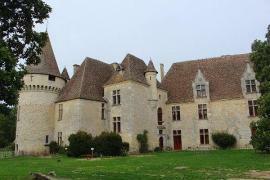 This impressive building dates from the 1600s and was the residence of the Bishops of Sarlat. At each end of the palace is a small round tower largely built in brick which adds a warmth to the slight austerity of the large stone building. 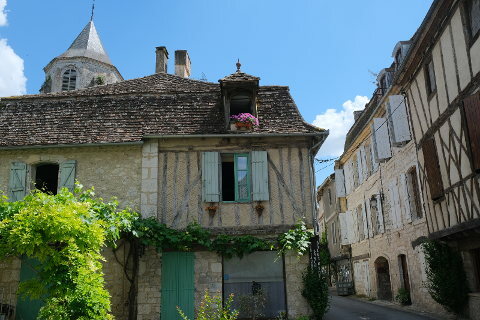 This is opposite the gothic church of St Felicien. Issigeac has a couple of nice tea-shops and a wonderful really old-fashioned looking bar - all excellent places to to pause and take the time to enjoy this lovely village. Take the Tour de Ville (the road which circles the town) to see a good example of 18th century architecture - the Provost's House. The other big attraction in Issigeac is the Sunday market. 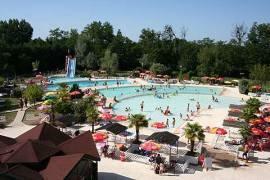 A small local affair during the winter, in the summer it takes on another dimension and grows to fill the town almost completely - it is now the main Sunday attraction in this part of the Dordogne. Despite the large number of tourists it is still worth the visit as the market spreads throughout the medieval streets of Issigeac and adds warmth and colour. Filled with local produce you can buy everything you need. In July and August there is a Marché nocturne, a night-time market every Thursday evening from 7 o'clock. This takes place in the square in front of the church. Tables are put out and you can buy everything you need for your evening meal and sit in the square to eat it. Many of the local villages have these night-time markets and there is a great atmosphere. Typically you can choose foie-gras or melon or salad for starter, then wander round the other stands where the main course choices are things like paella or lamb stew or sausage and chips. Deserts will usually include crepes - a big local favourite. (Paper plates and plastic cutlery are all provided). Another stall sells wine and they open the bottle and give you plasitc cups to drink from. Basically you don't have to bring anything and can sit outside and enjoy a very reasonably priced meal. The Flower Market, Marche aux Fleurs, in the spring - see Issigeac swamped in colour. The Foire aux Paniers et à la Vannerie in July - this is a willow weaving festival and you can buy baskets and gorgeous ornaments and plant supports for the garden. If you have children there is usually a willow-weaving workshop for children in the afternoon. 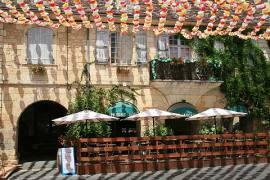 Issigeac's bodega is in July - music, food and drink all in the open air. Lots of fun. 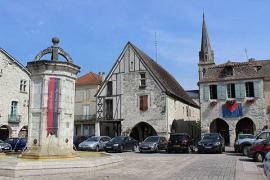 Medieval day - Issigeac's medieval day is in August and is a great day to see the village. Lots of the locals will be dressed in medieval clothing and there is a parade which includes jugglers and street theatre. Medieval crafts and music and art are all on display. A great day, especially if you have children. Pumpkin festival, Foire aux Potirons, in October - see pumpkins and gourds in all shapes and sizes and colours and sample the delicious pumpkin soup. El Borini - 19 euro lunch menu. 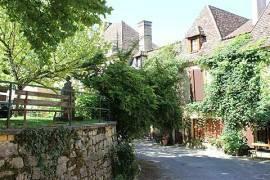 The market town of Bergerac is nearby and has a lovely old town and a nice position on the edge of the Dordogne river. Eymet is a popular bastide town and has a good market on a Thursday.